Sign up today for our introductory Personal Training package for only $49 / session! Are you a busy mom that struggles to fit YOU time in? It’s time to take control of your health and start working towards your health & fitness goals. Contact us to hear about our 6 month or 1 year bridal fitness packages and get in amazing shape for your wedding. Click here to hear from our clients. Stay in shape during and after your Pregnancy. We specialize in Pre & Postnatal fitness training. Contact us to book your FREE Consultation. Why wait? Click here to sign up for your free 1 week Boot Camp pass and lets get started working towards those fitness goals today! Whether you are new to fitness or you are looking to jump-start your current routine, our Fitness Boot Camps program is a great place to start your journey to a healthier lifestyle. Contact us today for your 1-week FREE trial! Having a Personal Trainer will help you reach your fitness goals 3 times faster than on your own. Whether your goals are weight loss, building muscle, toning and sculpting your body, endurance or sports-driven athletic purposes, Premium Personal Training, Newmarket will help you get there! Book Your FREE consultation today! Why not work out with your friends and help motivate each other along the way? 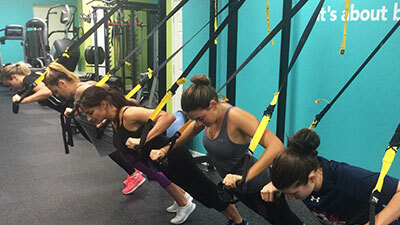 Premium Personal Training, Newmarket offers Team Personal Training (2-4 People). Save money, reach your fitness goals as a team and celebrate your success together. Contact us today to book your FREE consultation. 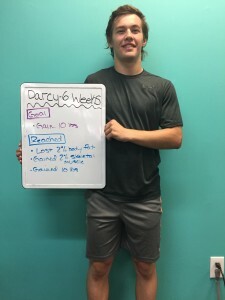 Darcy came to us 6 short weeks ago with the goal of gaining 10 lbs of muscle before his hockey season starts. He was drafted into a competitive team in Timmins that required him to make these changes. Although it was a tough goal to reach, it was not unattainable! With a good diet and exercise Darcy managed to reach his goal of 10 lbs of muscle gained, plus, 2% decrease of body fat, and 2% increase of skeletal muscle! – Way to go Darcy, and best of luck with your season ahead! You will reach you GOALS 3x faster with a Personal Trainer than on your own. Our mission is to inspire health and fitness with our members by providing them with individualized training, coaching, and guidance from a caring and supportive team of fitness professionals in a fun, safe encouraging atmosphere. Our vision is to be the #1 Fitness & BootCamp Studio in York Region. Our goal is to Change as many lives as possible in a positive, encouraging and healthy way. Everyday! Please fill out the form below and we will call you within 24 hours.